← Checking In On Charts! This week we have a treat here at Chart Chums: our very own guest blogger! This week we will hear from Alyssa Newman, a remarkable second grade teacher at PS 277 in the South Bronx. 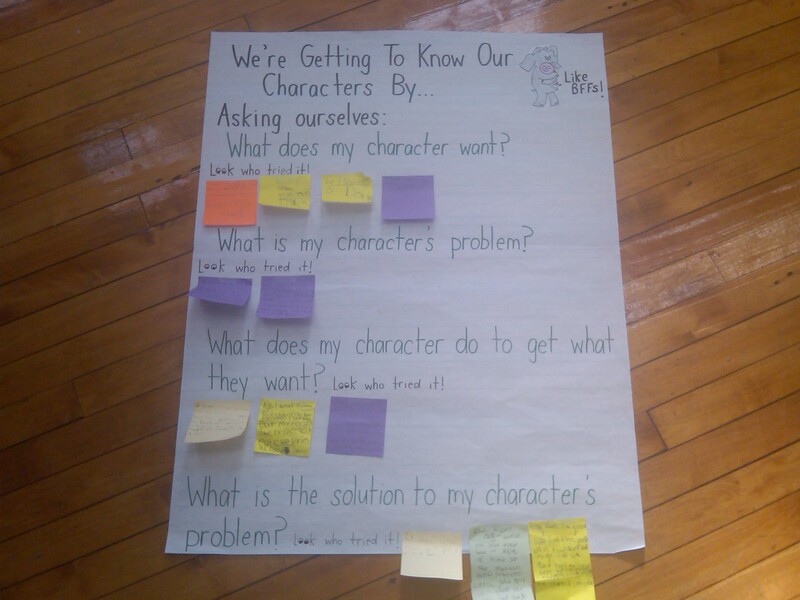 Alyssa is a charting pro, and what follows is her description of how she is using charting to help her students do great reading and thinking work around the characters in their books. Enjoy! 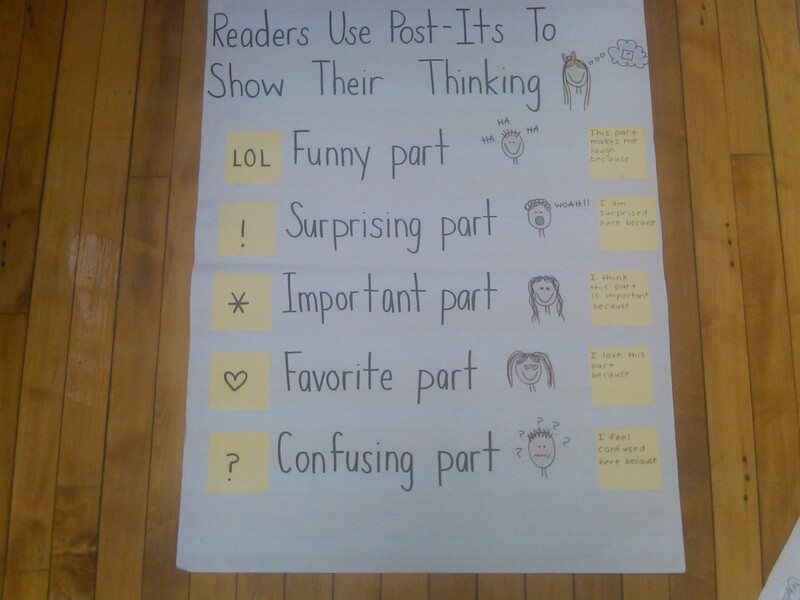 When I first introduced this chart, the only post-its I used were the symbols, because this was the first writing about reading work we tried this year. Of course, the post-it was a novelty, and yes, more than half my class approximated by using 14 post-its in one 16-page book (did you know you could have 14 favorite parts in just one book?) The mid-workshops and shares were good times to conquer this issue. It didn’t take long before my kiddos were ready for more of a challenge; so, I pulled the chart back out during another minilesson and taught my readers that we can use words, not just symbols, to make our thinking visible (this time I added on the prompts). 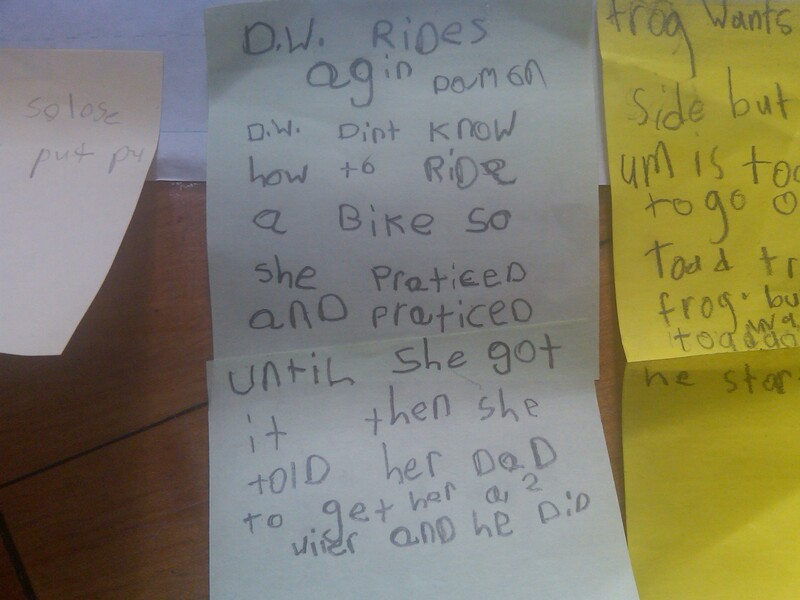 I carefully selected the language on the post-its—I could have used the same beginnings, “This part is my favorite because… This part is funny because…” But I wanted kids to have a variety of language choice when articulating their thinking. 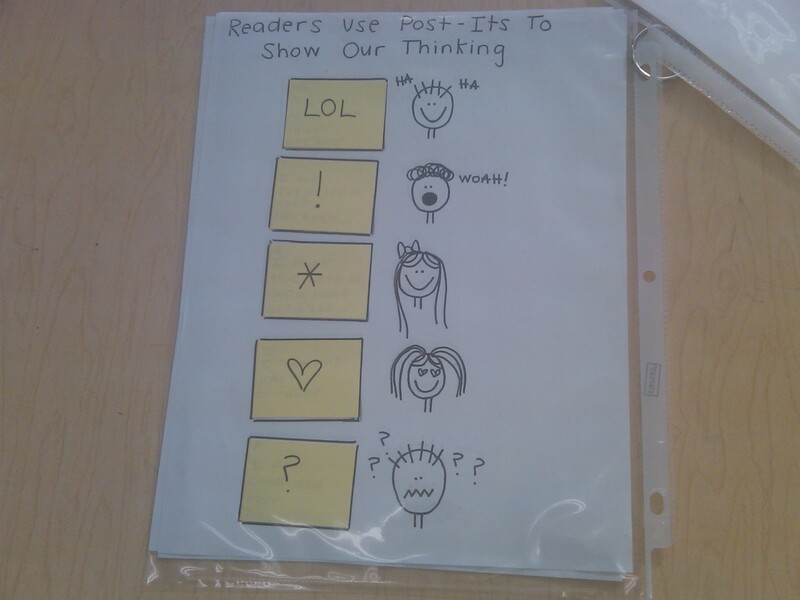 I gave the kids these differentiated personal charts to keep in their book baggies. I experimented with this a bit, in terms of who gets what chart, and I found that it worked best in my class to have my readers in C-I books using symbols only and J+ readers using prompts (there were a couple of exceptions). My readers below J still get an opportunity to try on these prompts during read alouds in their reading notebooks (which has a special section for responding to the whole class read alouds). We’re now in our character unit, and the kids feel much more comfortable writing about their reading. I wanted to continue this work and angle it to support the unit, so here’s what I did. I created a pre-assessment using two read alouds (The Meanest Thing To Say –Bill Cosby and Iris and Walter The Sleepover –Elissa Haden Guest, both Level K) and had kids stop and jot at four different points in the text (I did this with two books so I had enough data on each student.) The questions each assessed another skill that we would work on in the upcoming unit. These included retelling/determining importance, prediction, inference, and author’s purpose. I analyzed the student responses, and noticed many of my students needed help with all four of these skills—but if I wanted to tackle any of them, I needed to start with retelling/determining importance first. I also had to think about which visual, concrete supports they would need in order to do this. This chart provides sample questions that will lift the level of children’s thinking. So…that’s how this chart came to be. Teaching kids to figure out what the main character wants, what the problem is, what the character does to get what they want, and what the solution to the character’s problem is, is one strategy to meet the skill of retelling/determining importance. I taught each of these components in a separate minilesson, and then followed up teaching kids to read across each of the post-its to retell the story. The chart acted as an ongoing reference point. During the share each day, kids were able to put up their post-its in the appropriate category. My class has a Mo Willems/Piggy and Elephant obsession (okay, maybe it’s more me than them), so I used the “Very Fancy” concept from I Am Invited To A Party to create the continuum (way cooler than 1-2-3-4.) 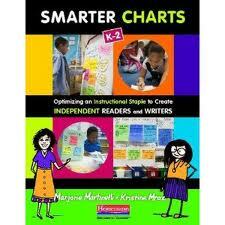 This chart is an exemplar tool that I used to accompany the previous chart during my minilessons. The yellow post-its are the work that I demonstrated during the “teach” portion of the minilesson, and the orange post-its are basically a tool for kids to use during the active engagement, and for when they want to try out the work independently. When I sent my kiddies off, they were super excited to try and be the fanciest they could be! 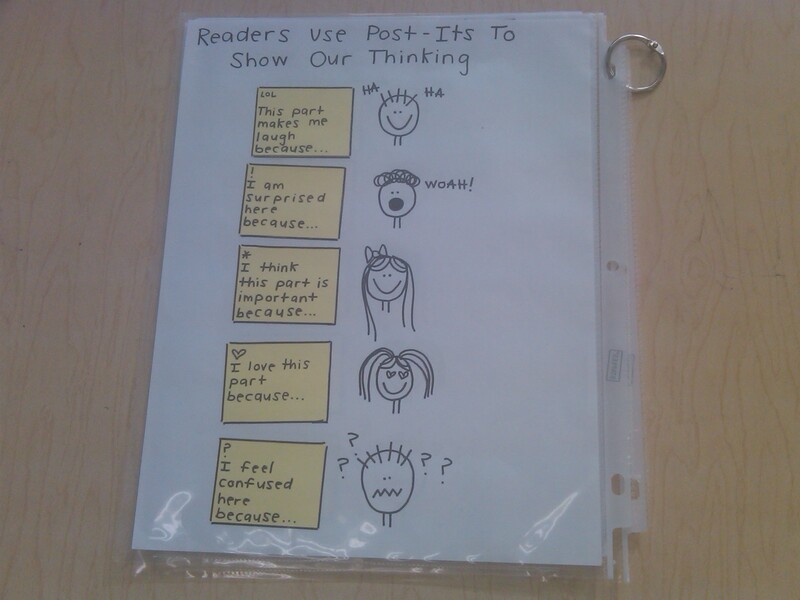 Having them come up and share their post-its at the end of the workshop holds them accountable for this, so I plan to make them their own personalized version to keep in their book baggies, as well (this also helps with the foot traffic between table and chart during independent time!) In the next bend, I’ll create a similar chart, only that one will support inference work. Alyssa has generously offered to answer any questions about her great work here, and her future work around this. You can send an email to chartchums@gmail.com and we will happily get it to her! Thanks again to Alyssa for sharing her great work, and until next week, happy charting! I love these charts–so simple and easy to follow. I have been very impressed with the examples on your website, and I was hoping that at some point I would see some upper grade charts. 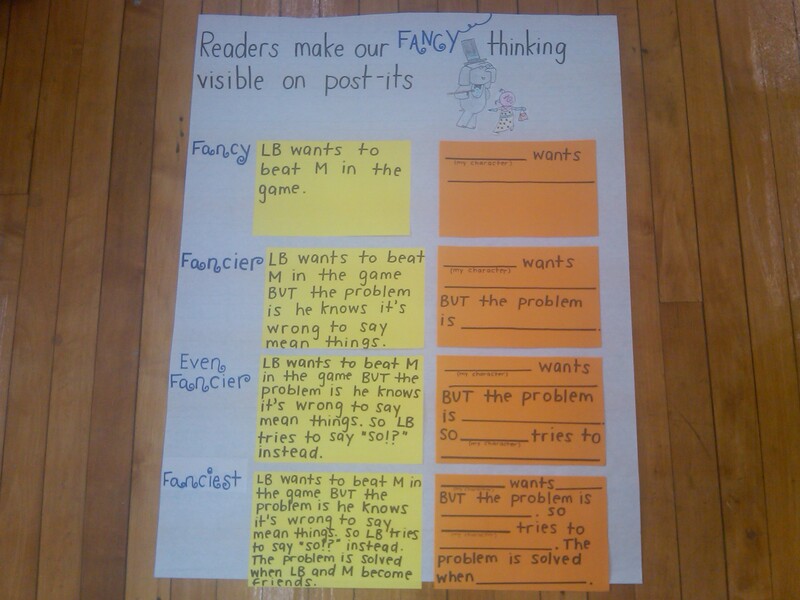 I teach fourth grade, which tends to be more word-intensive, and I would really appreciate seeing some examples of reading and/or writing charts for the upper grades. Thanks! I am interested to see what you chart will look like for inferencing skills. I am working on that with my 2nd graders right now. We visited the skill earlier in the year and now we are sharpening our techniques. I would love to have a chart for them to refer to. Looking forward to what you share next! if you email chartchums@gmail.com, i would be happy to talk inferencing charts with you!! I’m wondering if Alyssa could return as “guest blogger” and show what happened in the predictions, inferring, and author’s purpose bends! Believe it or not, but I teach K and have a DRA 20 reader. These simple response charts have given me some great ideas about differentiating for her, which is always a challenge! Thanks! I love the idea of individualized personal charts. Will look for other ways to provide students charts to keep in their book box for easy reference – especially when wall space is limited.